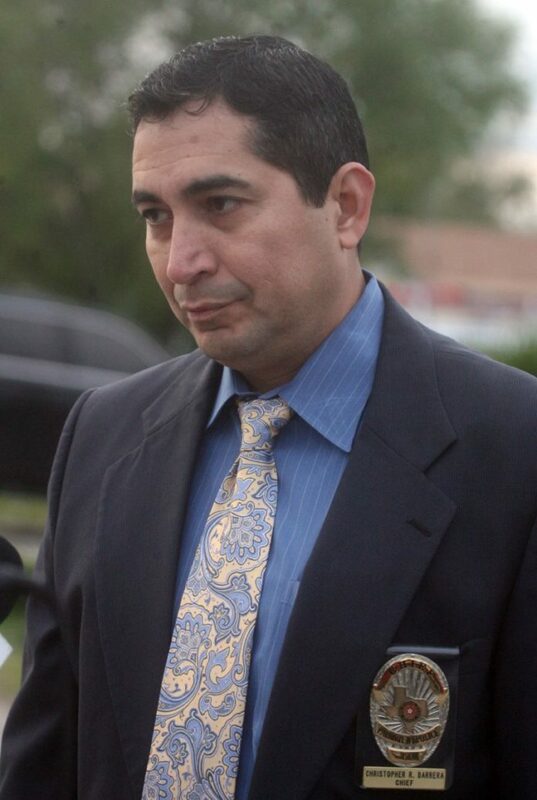 PALMVIEW — Police Chief Christopher Barrera was terminated Monday, ending severance negotiations between his attorney and the city that began after he filed a sexual harassment complaint against the interim city manager. Barrera, who had been closing in on 20 years as Palmview police chief, was terminated by unanimous council approval based off of disciplinary and performance issues, according to interim City Manager Leo Olivares. The chief’s days were, arguably, numbered since he and Olivares met to discuss his performance in March. The interim city manager reportedly said he had lost faith in the chief’s ability to effectively lead the police department and told him to consider his options. Three days later, the chief filed a sexual harassment complaint against Olivares. Olivares denied the allegations and City Attorney Gus Acevedo concluded the allegations did not amount to sexual harassment, according to a report dated April 5. After he initially filed the harassment complaint on March 19, Barrera was absent from the department for nearly two weeks, taking a combination of sick and vacation days. He returned to work April 9 but was then placed on paid leave on April 16 as a review of his performance and negotiations between the city and his attorney continued. The following day, Olivares’ contract was extended for another six months. Lt. Gilbert Zamora, who was appointed interim chief in Barrera’s absence, will continue heading the department until a permanent replacement is hired. Following the council’s decision, Barrera said he expected, after conferring with his attorney, that he would file a formal complaint on the sexual harassment allegations. Barrera said the allegations were not investigated by the proper agency and his attorney, Javier Peña, said the city’s review of the allegations was incomplete and not a real investigation. Given that the harassment issue remains unresolved, at least in Barrera’s view, he said he was surprised by the council’s decision to terminate him. “I don’t see why the city would want to get itself into some type of a legal battle like that,” he said. However, City Council member Joel Garcia said the council had no choice but to take action based on newly surfaced information, the details of which were not disclosed. Garcia and Sarabia, along with Council member Javier Ramirez, are the newest members of the council having been elected in November 2016. The three ran as a team on the same “Progress for Palmview” slate and their win ushered in many changes to the city’s administration. Barrera previously stated he didn’t feel like the new council supported the staff and said he felt overburdened because of staff reductions. However, Olivares countered that many of the issues he found within the department predated the staffing issues.